There is an inevitable sadness that comes almost unexpected the day one realizes a parent is no longer as healthy, and full of vibrant life as he or she once was. It is that defining moment when the stress lines turn to well-defined wrinkles, age fails to defy time, and caretakers become the ones needing care. 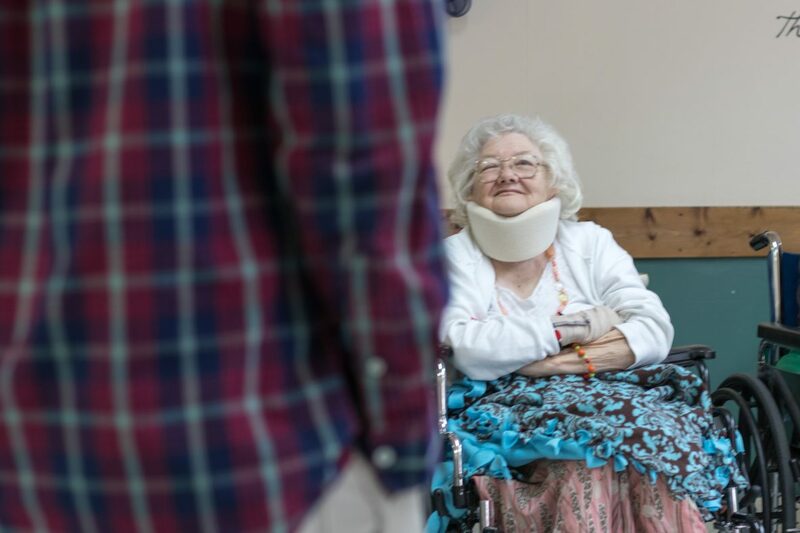 For some, those last frail years are well spent in the company and care of loved ones, but others are sent away to be cared for in a hospital, nursing home, or some type of care facility. There may be a million reasons for this sendoff, and in many cases, completely understandable. Nevertheless, for the elderly who is removed from the familiar, this is often a time filled with sadness, and a sense and deep loss. Understanding the mandate from God to “honor thy father and mother,” and every person’s duty to care for the elderly, or the destitute, during the month of August, members of the Bridge staff together with some of the Abante team served at the Gateway Nursing Home in Cleveland, Georgia. While there, they engaged the community of elders with stories, music, and simple conversations. The community at Gateway was very appreciative for their visit. They were grateful to have someone to share their stories with, to sing with, and simply BE with. Serving the elderly is not about how much is done for them, but about being present with them in the moment; listening, and simply loving them. Express appreciation through a gratitude list that specifically names the actions, activities, and virtues your parents fostered that were positive in your life. As an extra, perhaps hire someone to write it in calligraphy. Present it as something that could be framed and kept. Even those parents who neglected their child may have done some things right. Acknowledge these as sincerely as possible. Give the gift of presence. Thanks to technology, we have so many ways to offer our time. When possible, in-person visits are best of course. But calls, cards, or even simple “thinking of you today” text messages can communicate care and pierce the isolation many elderly feel. Work as well at connecting your children to their grandparents’ lives. Even when a parent resists knowing your children, as my father did, your efforts are worthwhile for your kids’ sake. Seek to understand them. We want so badly to be understood by our parents. But even if this doesn’t happen to our satisfaction, it’s time to shift our focus to understanding them. Show interest in their past, their stories, their photos. This is, after all, your family history as well. If possible, record the memorable family stories others will enjoy. If a parent continually demands attention to tell her stories, set aside a reasonable time to make this happen. Just listening shows respect and honor. MANY ELDERLY EXPERIENCE A SENSE OF POWERLESSNESS OVER THEIR OWN LIVES. MAKE TIME TO HEAR THEIR CONCERNS, AND RESPOND TO THEM. Involve them in decisions regarding their future and their care, whenever possible. Many elderly experience a sense of powerlessness over their own lives. Make time to hear their concerns, and respond to them. Even when you have to act against their wishes, help them to feel heard and involved in whatever decisions are made. Help them financially, as you are able. You already know the obvious reasons: They gave your life, first. That’s enough right there. Now add food, a bed, flute lessons, baseball games, science projects, and so on. Even if you got little of these, God still tells us clearly, “But if anyone does not provide for his own, and especially for those of his household, he has denied the faith and is worse than an unbeliever” (1 Timothy 5:8). Sincerely ask them to forgive you for the lapses, inadequacies, and rebellions of your past and your part in whatever difficulties have occurred between you. A humble heart heals both confessor and hearer. Forgive them. If the six suggestions above feel impossible to you, reverse the list and start here. Release your parents from the debts they owe you. Not only are we commanded to do this, but we must understand that they cannot pay back what they owe us—often they are bankrupt themselves. So we pass on to them the gift of mercy given to us by God Himself. This not only frees them, but it frees us from acting as judge and jury over them. That’s God’s job. Seek counseling if you need help with this. And begin to move toward your parent with the mercy and wisdom the past is now able to give you.